he last page of a folder presenting the offer of the French Totaldac company reminded me of the way in which digital technology has developed in the last thirty-five years, in the context of the audio domain. It all started in the year 1980 when the fundamentals of the Red Book CD-CA standard were published. Since that moment, two things have been emphasized that were supposed to make it different from the so-far dominant standard (i.e. the LP record): convenience and the fact that that it doesn’t wear out while being played, as well as clarity of sound. The first of these claims proved to be half-true only – it is known today that aluminum used for CD production oxidizes with time, because of which more and more original information must be supplemented by interpolation circuits in the player. The claim concerning crystal clarity of the silver disc sound seems to be much more important. For many years after the year 1985, when the sales of vinyl discs were falling, the “Digital Recording” label was proudly placed on LP recordings, which was aimed at convincing consumers that although it was an old format, it was also improved. The information could most often be found on discs with classical music, but I also have it on my copy of Brothers in Arms album, which was the first band’s album recorded on a digital multi-track cassette deck. Today we know that it was exactly the opposite – the advantages of analogue recording and mixing were lost, and people failed to exploit the advantages of digital technology. The only claim which proved to be “prophetic” was the one concerning convenience and comfort. That was the first phase of the digital revolution. It was believed then that the revolution was a remedy to all aches and pains, and efforts were made to improve the sales of black discs by emphasizing how much they had in common with the new technology. As time passed, however, people came to their senses and regretted having thoughtlessly sold their vinyl disc collections. 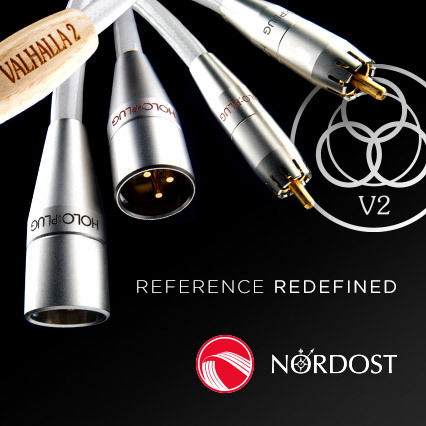 For a long time, at least in the circles of people who are interested in high-quality sound (i.e. among audiophiles), the dominant standard is the one in which the model for “digital” sound (i.e. sound obtained from this type of signal) is the Long Play disc. If somebody wants to emphasize high quality of a player or a D/A converter, they say it produces “analogue” sound. Incidentally, it is similar in the case of D-class amplifiers – if someone wants to compliment them, people say that they sound “analogue”. The term “analogue” is almost always associated with the turntable and the vinyl disc. It probably won’t change, even if the best digital systems are taking one step further and are directly bringing us closer to the analogue master-tape, without distortions characteristic for the LP format. The path which allows us to meet this aim appears to be fairly simple – at least now, when we already know what to look for. The most basic aim is maximum jitter reduction. Jitter is understood as a whole range of digital distortions caused by imprecise signal clocking – both at short intervals, i.e. within a given impulse, as well as within longer time intervals. Jitter can be caused by many different factors, e.g. a low-quality clock, insufficient power supply of the clock and digital circuits, inadequate transmission cables (digital interconnects), insufficient shielding, etc. All of these factors have recently been significantly reduced and for the first time it can be said that digital sound sounds “analogue” without blush on one’s cheeks, caused by such apparent abuse. The French Totaldac company run by Vincent Brient proposes its own method of digital signal conversion. It is one of just a few (!) audio manufacturers that have constructed their own digital-to-analogue converter – and it’s not about a device, but a converter. Almost all the remaining manufacturers use ready-made chips produced by one of the following specialist companies – ESS Technology, Burr Brown, Crystal or Wolfson. The exceptions that must be mentioned here are: dCS with their Ring-DAC and MSB Technology (read in Polish HERE. Now it is also Totaldac. In this respect, the French company resembles MSB: its converter is simply a set of ultra-precise Vishay resistors, switched in integrated circuits. It is impossible to build a more precise DAC system. However, this is not everything that can be done in this field. Vincent proposes a few levels of sophistication based on a basic “brick”, i.e. the DAC d1-single. 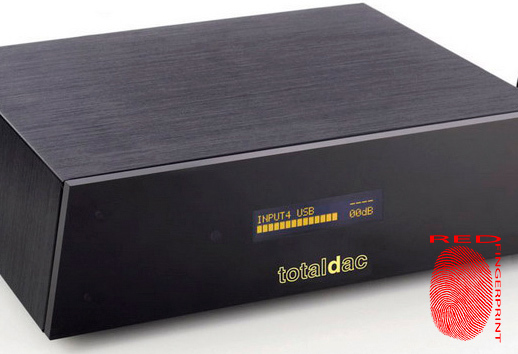 A Totaldac system can be built up gradually, starting with a single device with an external power supply unit, i.e. 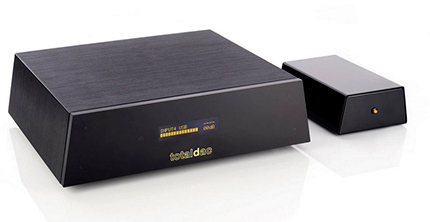 the d1-single converter (price: €6960). If we equip it with an audio file player module, it will become an integrated file player called d1-integral and will cost €8400. There is also a d1-single version with a tube output – the d1-tube (price: €6950). This DAC features most of the solutions that we can find in all Vincent’s more expensive systems. In the DAC, digital signal is loaded onto a FPGA chip, operating alongside the FIFO buffer (memory) which delays signal by about 10 ms. It is enough for signal overclocking and jitter minimization. However, it is still a single box with an external, small PSU. The next step may be to double the number of resistor ladders in the appropriate D/A converter, which results in smaller quantization errors and lower noise, etc. This is how the d1-dual is created. We wrote about it HERE. It costs €9900. It is a variation of the company’s complete digital source. The system consists of two boxes. The first one houses file transport and a circuit which re-clocks digital signal, with digital inputs, whereas in the other one there is a converter – one of three versions (single, tube or dual). The systems cost, respectively, €10 850 and €13 790. Finally, there are versions consisting of three boxes, with three external PSUs. The first of these versions is a system with an external circuit which re-clocks signal and two d1-dual converters operating as monoblocks. Instead of two resistor ladders per channel there are four per channel here. It is a fully balanced system. On the very top there is a system which costs €29 500 (plus an extra charge for a file player system). It consists of a reclocker with digital inputs and two monophonic D/A converters. Instead of four, we have as many as six parallel resistor ladders per channel in them – the circuit is unbalanced. Thanks to the parallel connection, it was possible not to include any amplifying circuits and buffers on the output – signal from the DAC is immediately sent outside. A disadvantage of this solution is lower output voltage – instead of 3.1 V we have 1.4 V. If we are using an active pre-amplifier, there won’t be any problem with that. This is the system that we tested. 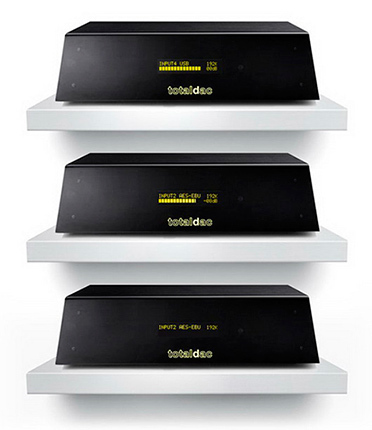 Basic Totaldac systems offer a lot of options, such as a headphone output, a filtered subwoofer output, etc. The top d1-twelve model does not have them. All signals are supplied to the main device (“reclocker”). Signal is split in it into two channels and sent to the monophonic DACs with the use of two AES/EBU digital cables. The company supplies its own, quite good interconnects of this type, but I used Acrolink Mexcel 7N-DA6300 cables. The monoblocs are also connected using two extra connectors – a digital BNC interconnect which synchronizes the clock signal and an RCA interconnect which is used to transfer control signals. The first cable is the most important one – in my system it was the Acrolink Mexcel 7N-DA6100, whereas the Oyaide DR-510 was used to transfer control signals. The system version which I obtained for the test had an installed file player. So, Vincent also sent me a router with a linear PSU, as well as a NAS and a set of cables, including his own Ethernet cables. However, I didn’t use that option. I was interested in how the d1-twelve operates as a DAC with external signal from physical media: CDs, DVDs and Blu-ray Audio discs. Signal was sent to it from the Ancient Audio Lektor AIR V-edition player with the Philips CD-Pro2M transport, as well as from the multi-format Primare BD32 MkII player, which I used to play DVDs, DVD-Audio discs and Blu-ray Audio discs (signals up to 24/192). I also checked how the system behaves with signal sent from a computer through a USB input, including DSD signal. As regards DSD, Vincent made it possible to convert all PCM signals to DSD, which can be changed in the device menu. I did not use that option, as I think that every type of signal should be converted in its original form. Then, it sounds better to me. Sonny Rollins, Saxophone Colossus , Prestige/Analogue Productions CPRJ 7079 SA, SACD/CD(1956/2014). Sonny Rollins, Saxophone Colossus, Prestige/Victor VICJ-60158, XRDC (1956/1998). Do you know what escape velocity is? In Stephen Hawking’s book entitled The Universe in a Nutshell, the phenomenon is illustrated with a suggestive drawing of an enormous steampunk cannon which fires a ball on one of the pages. The ball falls on the next page, apparently not having reached escape velocity. In a nutshell, it is about escaping so fast that the escape is successful. In Hawking’s words: “If […] the initial speed of a body is greater than some critical value – the so-called escape velocity or the first cosmic velocity, the pull of gravity won’t be able to hold the body which will escape into space” (Stephen Hawking, The Universe in a Nutshell, quoted from the Polish translation: Wszechświat w skorupce orzecha, Poznań 2014). Just to remind you: the value equals ca. 12 m/s on the Earth. The Totaldac d1-twelve belongs to the elite group of devices which seem to escape both the gravity of their mechanical nature and of our habits. It is a thought which came to my mind immediately after I used the tested DAC to listen to a few recordings whose sound I was mostly curious about. The follow-up listening sessions and other discs only made me confirm myself in this conviction. Two weeks earlier I had achieved a very similar effect with the Naim Statement amplifier, just like a year ago – with the TechDAS Air Force One turntable and the dCS Vivaldi digital system.